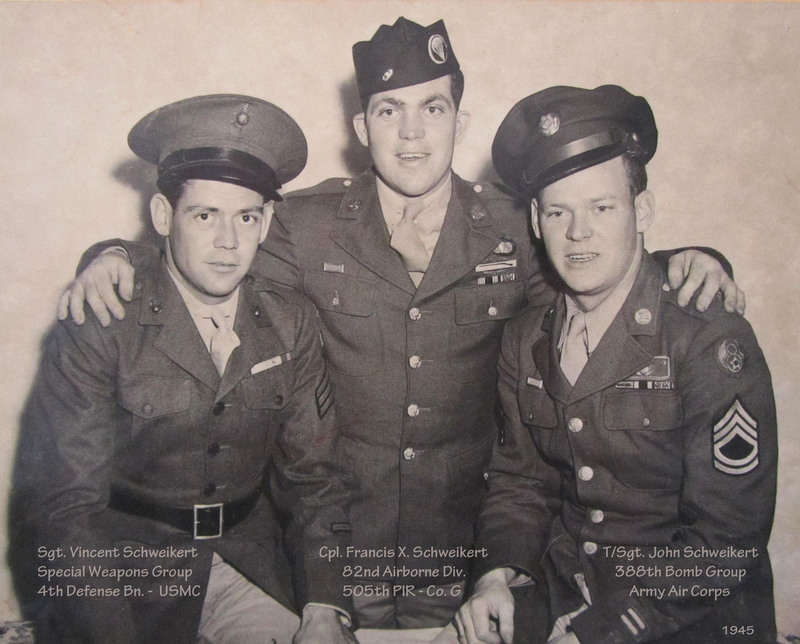 Francis X. Schweikert was born on April 23rd 1925 in Brooklyn, New York, he was the youngest of four brothers who served during WW II. Francis began his Army service on July 3rd 1943 from Newark, New Jersey, at the time his family lived nearby in North Arlington. He reported to Fort Dix, New Jersey on July 24th, it was here during induction week that a 2nd Lt. asked him if he was interested in becoming a paratrooper. Francis' basic training was at the Aberdeen Proving Grounds in Maryland, followed by four weeks of jump school at Fort Benning, Georgia. He received his wings on November 13th 1943. After graduation, he was placed in a communication squad and entered radio school November 15, 1943. Three days later on the 18th he was hospitalized with severe abdominal pain. Following surgery for herniated stomach muscles, he received a six week no duty, no furlough restriction. The first 3 weeks were spent in the hospital. The doctor also restricted him from jumping for 6 months. He received no jump pay during this period. He was transferred to Camp MacKall and sent to carpenter school by his C.O., becoming part of the permanent cadre there while on restrictions. On April 23, 1944 with his restrictions lifted, he was part of a group of paratroopers, and their equipment, that traveled in forty C-47s from North Carolina to Easthampton, Long Island, where they took part with 8000 soldiers in maneuvers. The following month, on May 30th, Francis sailed on the Queen Elizabeth for England. Assigned to the 505th Parachute Infantry Regiment, Company G, he arrived at Camp Quorn, England on July 7, 1944 while the regiment was still in Normandy. On September 17th he made the jump into Holland with the second squad, second platoon of G company. He became friends with Pfc. 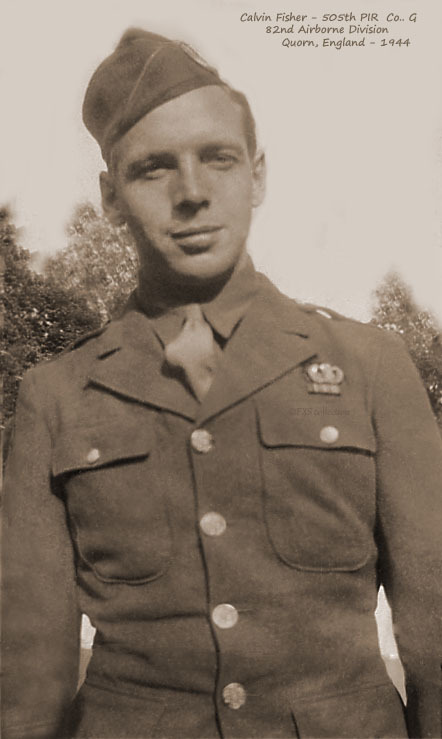 John Diffin, who was a Normandy veteran, and Pfc. William "Chico" Sanchez. While in Holland, John and Francis lost their friend Pvt. Elmer Baker who was killed at a listening post when the Germans counter attacked the position in early October 1944. The regiment was relieved in Holland on November 12th 1944 and arrived in Suippes, France, on the 17th of November. As new replacements arrived the regiment trained and re-equipped. Word of a German breakthrough in Belgium sent the 505 by truck to Werbomont, Belgium on December 18th, 1944. Company G took up defensive positions along the Salm River near Grand Halleux, Belgium. They were to hold the bridge across the Salm. His good friend, Pfc. William “Chico” Sanchez, was one of five troopers manning a listening post on the other side of the river. Elements of the 1st and 9th SS Panzer Division overran the post killing Pfc. Sanchez and Sgt William Beaty. According to Pfc. John Diffin, Francis was manning a machine gun on the high ground overlooking the Salm when the Germans reached the river. The bridge was blown with enemy soldiers on it and as the rest started to cross at the rivers' edge they were greeted with such a wall of concentrated fire not one made it to the other side, said G company platoon Sgt. "Chris" Christensen, adding he’d "never seen anything like it before or after." The 505th’s defensive line along the Salm was over extended, on the morning of December 24th, Field Marshal Bernard Montgomery ordered the 505 to withdraw from their positions along the river to the town of Basse Bodeux. **Sgt. John D. McKenzie of the 456th Parachute Field Artillery Battalion, writes in his book "On Time, On Target", of how his artillery observation post at Trois Pont, Belgium, manned by five paratroopers of the 456th, was overcome by twelve SS men from Colonel Peiper's Kampfgruppe. (They were part of Peiper's Kampfgruppe of approximately 800 SS men making their way back to German lines on Christmas eve 1944 after running out of fuel for their panzers.) Sgt. McKenzie's observation post was only two miles west of Field Marshall Montgomery's new Christmas eve defensive line at Basse Bodeux. **G company Sergeant Bill Blank's memoir also mentions the night of the pullback December 24th 1944. "We moved several miles to a crossroads where we set up defensive positions in and around a group of farm buildings. That night the Germans moved up and had in mind setting up positions where we were dug in. They were driven back and we retained our positions." **According to General Gavin's book "On to Berlin" (page 240) published after the war, Col. Ekman estimated there were 500 enemy soldiers withdrawing through the rear areas of the 505 that Christmas eve night. **Mention of the Christmas eve firefight in the March 1945 Tent City edition of the Static Line newsletter. Francis was now a POW at stammlager XIIA in Limburg, Germany. Months later, as Allied front lines approached the prison camp, guards and prisoners began their move deeper into Germany. On the 23rd of March 1945, the POWs left stalag XIIA arriving at Atzbach, Germany in boxcars on March 27th. The next day, on the 28th they were liberated by the 7th Armored Division. There is a written account on the 7th's home webpage under; POW camps liberated; Wetzlar / Giessen. After liberation, March 28th 1945, Francis made his way to LeHavre, France, sailing for the States on the U.S.S. General W. P. Richardson, leaving April 14th 1945 arriving at Staten Island, New York, April 29th. He received a months' furlough upon his return from Europe. In early June of 1945 he was assigned to the Second Headquarters Company, The Parachute School, Fort Benning, Georgia. In a letter home dated July 15th 1945 he wrote in jest "Yes, I'm in the Navy, they call us "The Bell Bottom Trousers", because we patrol the rivers here. We have two boats, one is a small yacht and the other a landing barge with a 10 horse outboard motor." After several months of this duty he was honorably discharged from the Army on November 30th 1945. In 1947 John T. Diffin visited Francis at the family home now on Staten Island, New York. They talked face to face for the first time since Christmas eve 1944, the night he was taken prisoner in Belgium. After a brief time as a civilian John re-enlisted into the Army and rose to the rank of Sergeant Major retiring in 1973. At the time he was the last World War II veteran on the rolls of the 82nd Airborne Division. Francis married Arlene Klose in 1949 they had 5 children. He was a carpenter for the New York City Board of Education at the time of his death, January 29th 1978. He is buried in Moravian Cemetery, Staten Island, New York. Francis had three sons that enlisted into military service between 1968 and 1972, during the Vietnam era. One son served in the Marine Corps and two sons with the Army. This first group of 9 pictures was taken at Camp Quorn, England before the Normandy campaign. All are G company paratroopers. They were given to Francis by John Diffin when he visited the Schweikert home in 1947. The text at the top of each photo, in "quotes", is the text John wrote on the backside. "To F.X. - your buddy John T."
I came back and crawled in the hole with you." "Fashion on parade - Lambdin"
"Pinson(Pynson) Horst Blasik Baker Lambdin"
The following 7 pictures were taken at Camp Suippes, France. November to mid December 1944. All are from G Company. If you recognize either of the two unknown troopers in the Camp Suippes photo below please contact me at this e-mail address. outpost along the Salm river, in Belgium. As Allied front lines aproached POW camp stammlager XIIA in Limburg, where Francis was a prisoner, the POWs began their move deeper into Germany. On the 23rd of March 1945, the POWs left camp XIIA arriving at Atzbach, Germany in boxcars on March 27th.On the 28th they were liberated by the 7th Armored Division. 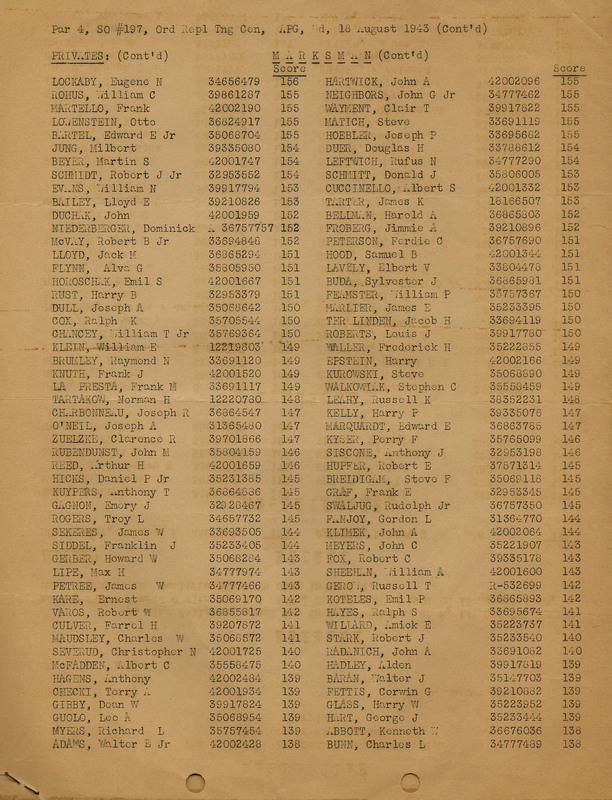 There is a written account on the 7th's home webpage under; POW camps liberated; Wetzlar / Giessen. Francis' brother Harry A. Schweikert earns Battlefield Commission. 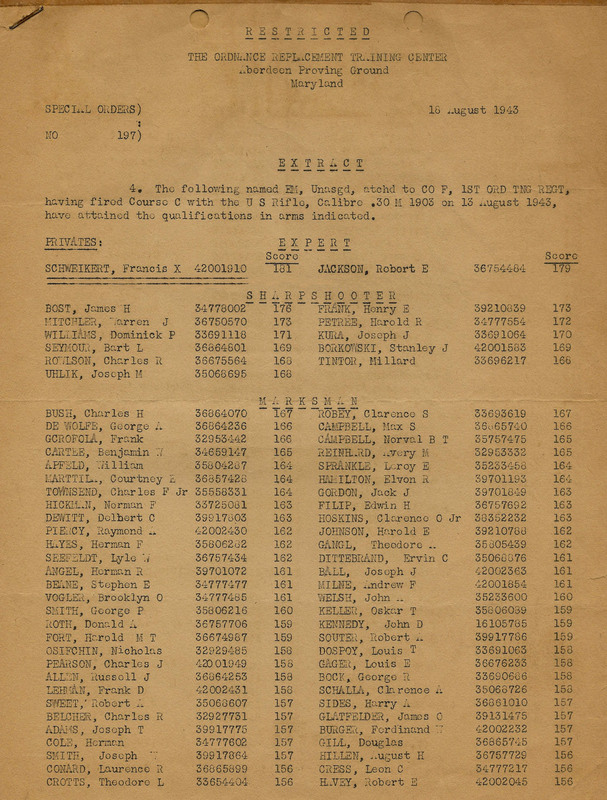 Francis' brother Harry A. Schweikert earns Bronze Star medal 1945. Vincent Schweikert (left) and Harry A. Schweikert (right) -1941. Long Island manuvers in preparation for D-Day. Wooden shoes from Holland, 1944. 82nd Airborne Division Pamphlet sent to Francis from Pfc. John T. Diffin while he was in Berlin. Photos Francis brought home from Holland. Francis's brother, Tech/Sgt. John Schweikert flew 30 missions in a B-17, first as a Gunner, and later in the war, as an Engineer. At times they dropped Safe Conduct Pass leaflets from the planes. John sent these home to my grandfather. He earned the Air Medal with four Oak Lleaf Clusters.